Today's pieces come from Animals of the Past by Frederic Lucas, one of the rare early publications on ancient life aimed for a popular audience. It was originally published in 1900; the images used in this post come from the fourth edition, published in 1913. What's nice about it is that it contains more than just Charles R. Knight paintings and plates from old Marsh papers. It features a few pieces by J.M. Gleeson, though the illustration notes at the beginning mention that he worked under Knight's direction. Gleeson's Ceratosaurus is worth the trip alone; as the Paper Dinosaurs site says, "The drawing has seldom been reproduced in modern secondary literature, but it has a charm and a liveliness that was quite unusual for the period, even by Knight standards." It bears a bit of a debt to Knight's famous Allosaurus, which is is posed like the mount featured early in the book in an uncredited photograph. Also featured is this Archaeopteryx by W.P. Pycraft. Two of my favorite images are the following scale representations, using a pair of mustachioed gentlemen as the models. If I ever do skeletal restorations, I think I'll opt for a fellow like this, just to stand out a bit from the Pioneer dorks that have become more popular recently. This edition closes with a message from the author that reveals him to have been one of those lovers of nature who rues the growing disconnect between human culture and the natural environment on which it depends, as well as the myopia that leads humanity to turn on its own species. It has been, and it is, an ever changing world. The great difference between past and present is that now by the agency of man it is changing much more rapidly. Man with his disregard of the past and small thought of the future destroys in a year what it took Nature ages to produce—man sweeps away forests, the growth of centuries, and with them wipes out of existence races of animals that represent the culmination of thousands of years of evolution ever onward and upward. With the disappearance of the forests comes the shrinking of streams and at the same time the sweeping away by floods of fertile soil that results from long ages of growth. Moreover, man turns his attention to his fellow man and blots out whole races, or, if they survive, it is with changed customs. For a bit more on this title, check out Mark Crowell's page. Boneyard 2.6: Time to Submit! The sixth installment of Boneyard's second life will shortly be upon us, with the hirsute and charming Kevin Zelnio hosting at Deep Sea News on Tuesday, February 1. If you've written about paleontology on your blog, whether this month or last year, share your knowledge with the world's only paleontology-themed blog carnival. And no, it's doesn't have to deal with dinosaurs! All long-lost critters, beasts, and creepy-crawlies are welcome. Email submissions to boneyardblogcarnival(at)gmail(dot)com. Get 'em in by Monday night. It's Friday, so let's hitch up our trousers and set to the serious business of surveying what's new in Mesozoic paleontology for the last week. Putting a finger on Linhenykus. There's a new alvarezsaur on the block, in all of its single-fingered glory. More at Dinosaur Tracking, Everything Dinosaur, Palaeoblog, and as Dave Hone is one of the authors of the description, Archosaur Musings (once, twice, and thrice). I also wrote about the little bugger (pun, as always, intended) and shared a video interview with Hone. The monstrous murderer arrives. The newest member of the tyrannosaurid clan is Teratophoneus. The Campanian period of Cretaceous Utah is being better and better fleshed out. More at Pterosauria, Saurian, and Dinosaur Tracking, natch. How did Tyrannosaurus get its supper? A new study looks at the paleoenvironment of Tyrannosaurus rex and attempts to estimate how much carrion would have been available, in an attempt to test the old "T. rex was an obligate scavenger idea." It's received some whithering commentary on the Dinosaur Mailing List, especially the way it plays fast and loose with biostratigraphy (basically, what dinosaurs lived when) and I expect to see some formally published counter-argument sometime soon. More at Palaeoblog and Dinosaur Tracking. Of course I'm prosauropod; I'm certainly not antisauropod. At Jurassic Journeys, Matt Bonnan writes about the new prosauropod Leonerasaurus, taking the opportunity to give a good crash course in just how paleontologists distinguish this group from the true sauropods. He writes, "as more data has surfaced it is appearing less and less likely that we can place all things prosauropod into the same bucket." Paleontology. It's never that simple. Read more in the description, available at PLoS. Variation in Allosaurus. Quietly, paleontologist Ken Carpenter published a look at variation among Allosaurus individuals in Paleontological Research. Mark Witton has returned from his viewing of the new David Attenborough pterosaur doc, Flying Monsters 3D, and... he's not impressed. At Pterosaur.net, he writes, "All told, it seems like this was a story told on the fly with little continuity checking between scenes. Indeed, we left the theatre wondering if anyone with access to the script, let alone someone with a background in pterosaur research, had read the narrative from beginning to end..."
At Don't Mess With Dinosaurs, Brian Engh shared his struggles coming to grips with that big theropod everyone has heard of and that's why it appears in headlines to stories about totally different dinosaurs. Though he recently began writing at Lab Spaces, Jeff Martz is still going with Paleo Errata. This week he shared his insights about how "big picture" studies and smaller scale research sometimes derided as "provincial" have a symbiotic relationship, and this perspective is often lost. Andy Farke continues to add insight into last week's Nedoceratops paper at The Open Source Paleontologist. He offers a nice look at behind-the-scenes paleontology, writing about his contact with Jack Horner and John Scannella, whose paper he was countering. "My dialog with John (and Jack) has been engaging, challenging, and stimulating in a unique way. I've learned more about Triceratops in the past six months than I had in the past six years..." Sniping from afar gets old, and this was a nice reminder that there's room for cordiality in paleontology, as well. More here and a bit more here. Stuff I've linked to at Twitter over the last week or so. This skeletal of Yoshi shows just how well he was adapted to bearing the weight of heroic, if rotund, plumbers. The Dinosaur Toy Blog reviews the Field Museum Anatotitan figurine... AKA "what I've got sitting on my CPU at work." DinoGoss provides a look at beaks among dinosaurs and early birds. Nice Eodromaeus illo by Ezequiel Vera. Mononykus? More like Mechanykus! An alvarezsaur reimagined as a war machine. When I posted this to Twitter this week, it quickly became my most retweeted link of all-time. We're not talking Phil Plait levels, but I was surprised by it nonetheless. 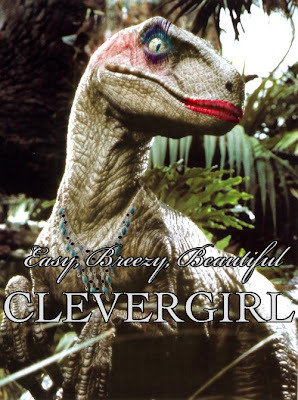 There must be something deeply resonant about a Velociraptor who has, in the words of my beloved Grandma Dot, "put her face on." Thanks go to I Effing Love Dinosaurs for sharing it. It's only appropriate to feature an alvarezsaur this week, so I'll pick one of my favorites, Peter Schouten's Mononykus from Feathered Dinosaurs. If you've got some cash socked away, the original can be yours. Sure, it's gone around the internet before. But damn it, I love me some King Curtis. University College of Dublin has posted a short video with resident paleontologist Dave Hone of Archosaur Musings fame, discussing the new alvarezsaur, Linhenykus. The first World's Fair was 1851's Great Exhibition in London, housed in a grand structure known as the Crystal Palace. After the exhibition's original run was over, the palace moved to its current location in Sydenham and became home to Waterhouse Hawkins' sculptures of prehistoric beasts, including famously inaccurate statues of Iguanodon and Megalosaurus (I'm smitten with these sculptures, and have written about them here a few times). Queen Victoria opens the Great Exhibition, shared by World Expo Blog via Flickr. Idly perusing the halls of Google Books recently, I came across a unique perspective on the exhibition's promise. It comes from a time before the dinosaurs were introduced, but as a Victorian artifact of the Crystal Palace I thought it was worth posting. As the Great Exhibition was set to begin in 1851, the James Nisbet company published The Crystal Palace: A Little Book for Little Boys, which is exactly what it says it is. It tells the story of Frank and George, two little boys who await their chance to visit the Crystal Palace with fevered anticipation. While Frank is a good, obedient child who minds his elders and trusts in the wisdom of his grandmother, George is unashamedly greedy and impatient, often shocking his friend with the depth of his selfishness. He sneaks out when he's told to stay in. He thwarts his governess Mary's attempts to discipline him. He bullies younger children and throws tantrums. The exhibition, organized to show off the wealth of England as the industrial revolution gained steam - excuse the pun - was seen as a way to showcase the potential of technology to pave the way to a better future. The Crystal Palace is a pious work, clearly written to remind the adult "Georges" of the world that their technological wonders could not offer true peace. It closes with Frank's dying friend Harry using the glass that encloses the wonders of industry as a metaphor for people reshaped by the hand of God: "...in this very furnace of affliction has my heart of flint, and my loose sand of character, that would not fix itself to any good, been melted down by God, to what you see." It's basically an eighty page tract, and a nice little peek into the changing Victorian world. Of all the precociously articulate language put in the children's mouths, my favorite bit by far is this mama's-boy fantasy, dreamt up by Frank. He's just become aware of just how put-upon George's mother is, and imagines himself switching places to serve as the doting son she so richly and desperately deserves. "I should like to sit upon a stool beside her," said he to himself," and read some pretty book, and talk it over afterwards, and put her pillows smooth, and watch when she seemed tired, and then hold my tongue awhile, and let her fall asleep. I would walk on tip-toe in her room, and never talk too loud to make her head ache, and run of all her errands, and so try to save the servants trouble. Mary would not grumble then, I hope. I must persuade poor George to turn over a new leaf, and see if he is not more happy by it." The fate of George is left open at the end, but I bet he snuck out of the house the first chance he had once the Hawkins dinosaurs were unveiled. 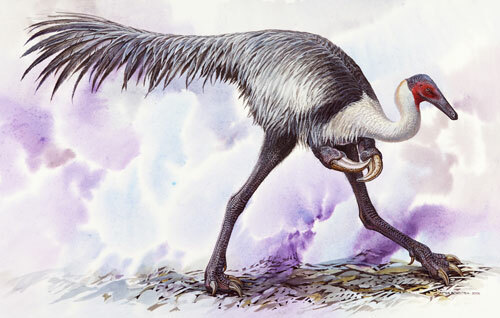 A year ago today at Archosaur Musings, Dave Hone wrote about the alvarezsaurs in anticipation of the description of Haplocheirus being published. He wrote, "It’s going to be a big year for alvarezsaurs in China if all the papers come through in time." They didn't quite manage to all come through in time. A couple months after Haplocheirus, Xixianykus was described. Then, all went quiet on the alvarezsaur front as the ceratopsians dominated the rest of 2010. Now, with the announced description of Linhenykus, fanciers of the still-obscure group of theropods can break out the cigars and celebrate. As described in PNAS by a team of scientists led by Xu Xing, Late Cretaceous Linhenykus is unique among the alvarezsaurs for possessing a single finger - no reduced nubbins, no hints at additional fingers simply missing from the remains. The reduction in forelimbs and loss of digits, along with keeled sternums perfect for anchoring robust muscles, have led to the popularity of a hypothesized "termite digger" lifestyle among them. Linhenykus monodactylus by Julius Csotonyi, from the University College of London press release. Evolution is a tricky thing, and Linhenykus is a good reminder of the falsehood of easy, linear models. If you take a look at Linhenykus and see its single finger, you might come to the conclusion that it represents the peak of alvarezsaur evolution, the storyline of which is the reduction and loss of digits. But that's not the case. When compared to all other members of the family, Linhenykus lands in the middle, an offshoot whose loss of fingers occured separately from later forms. One thing that's interesting about the alvarezsaurs is that they're one family that almost always is depicted as feathered. Having only been around for the last two decades, they were at times thought to be true birds. Even so, they fit well within the maniraptoran family of theropods; a cladogram put forth by Lindsay Zanno in 2009 has them nestled between forms that are known to be feathered, the therizinosaurs and the oviraptorosaurs. Will alvarezsaurs ever achieve the mass-popularity of their maniraptoran kin? I personally love them, but I'm not sure that the words "diminutive, possibly insectivorous theropod" really get most folks juiced up. But the questions they pose are juicy ones indeed, and anyone who enjoys setting their mind to such puzzles will probably be occupied with these little guys for a long time. As the Houston Museum of Natural Science undergoes a major expansion, including a new Paleontology Hall, things naturally need to be moved about. Some of these things are quite large, such as the Ankylosaurus created by Louis Paul Jonas for the 1964 World's Fair and extracted from the museum last Friday, January 21. More photos of the museum's expansion are available here, with more Ankylosaurus photos here. Today's title is Dinosaur Babies, published by Random House in 1991 and featuring the illustrations of Peter Barrett. Barrett was a long-time illustrator who worked on a number of the titles of James Herriott of All Creatures Great and Small fame. Unlike a recent featured title by a famed artist that didn't live up to expectations, Barrett's work is top-notch here. This is one of the notable few titles in this series that were both a)published after the "Dinosaur Renaissance" of the 60's and 70's, and b) incorporated those ideas into the drawings. The care and dedication to realistic portrayals of the dinosaurs sets it apart. It's not perfect, though. One illustration that seems a bit off to me is this depiction of a Tyrannosaurus approaching a herd of Triceratops in the popular "circle the wagons" defensive arrangement. Rather than menacing the herd, it looks to me like T. rex is just passing by on his morning jog. The tyrannosaur's babies back at the nest could be better executed as well - here you see the familiar "slapper" orientation of tyrannosaur hands as opposed to the better-supported "clapper" orientation, AKA "bunny hands syndrome." I appreciate the shades of avian behavior, with the tyrannosaurs begging for food, but I also think they could be a bit more juvenile in their proportions. In other spots, the juvenile nature of the babies is clear, as in the Psittacosaurus and Apatosaurus below. One nice aspect of the book is that it occasionally depicts the Mesozoic world from the perspective of a baby dinosaur, giving the rare chance to get up in a dinosaur's grill, as in this portrait of an Apatosaurus. The book wouldn't be doing its job without ample space dedicated to the "good mother lizard" herself, Maiasaura. In addition to the popular hadrosaurs making the cover, the book looks at the drama of a nesting site, as a pair of Troodons decide to put eggs on the menu for their next meal. If written now, the book would likely include downy fuzz on the baby tyrannosaurs, some indication of the long tail quills of adult psittacosaurs, and probably not depict sauropods as nurturing parents, as it seems that they probably laid massive amounts of eggs, sea turtle style, in the hope that sheer numbers would sustain the species. Of course, we'd all like a second chance. I, for instance, would prevent an errant hair from falling onto the scanner glass. These helpless baby maiasaurs deserve better. Quick note: Talk about second chances... As pointed out by a reader, this post was originally titled and tagged incorrectly with the name of a paleontologist named Paul Barrett instead of the artist's name, Peter Barrett. I deleted the original so the URL would reflect the proper name. Sorry for proving once again that I am indeed a huge doofus. Today, a post was accidentally published that was titled "Interview with Juliu Csotonyi." This was a placeholder for a coming post. Sorry for anyone who came here expecting that interview... consider this a teaser for it when it comes up. Welcome to the fifteenth installment of my (mostly) weekly digest of dinosaur news, Mesozoic Miscellany. With my attendance at ScienceOnline2011 last week, I've got a couple weeks worth of dinosaur news to round up. I'm going to try something a bit different, gathering links to major stories, then sharing posts from around the dinosaur blogosphere that deserve your attention. I'm not sure if it will work this way in slower new weeks, but this week it certainly does. Onward, then! It's always exciting to flesh out the murky beginnings of the dinosaurian dynasty, and the discovery of the small primitive theropod Eodromaeus helps out a lot. As significant as the description of Eodromaeus is, the paper made an equal splash for putting forth Eoraptor as a basal sauropodomorph. It makes sense that the earliest dinosaurs would be so easy to interpret differently, as subtle differences between them are used to try to ferret out the beginnings of the distinct branches of the dinosaur family tree we know so well. More: Video coverage from Science Friday and Discovery, Chinleana, Faster Times, Pterosauria, Dinosaur Tracking, 80 Beats. Also exciting are new pterosaur fossils, especially when they add to the stock of specimens of existing species. The new Darwinopterus fossil described this week in Science is really special, as it is apparently a mother who was killed just at the moment she was laying an egg. The egg is similar to the soft-shelled sort laid by alligators rather than the hard-shelled kind we eat for breakfast. More: Dinosaur Tracking, 80 Beats, Discovery News. Snaggle-toothed theropod Masiakasaurus recieved some attention this week with a monograph published in Smithsonian Contributions to Paleobiology [PDF]. Matthew T. Carrano, Mark A. Loewen, and Joseph J. W. Sertich's 53 page paper provides an overview of the noasaurid clade within which Masiakasaurus fits, though because the fossils known are so fragmentary, they hesitate to draw any broad conclusions about the group's evolution. Also notable is Lukas Panzarin's wonderful restoration of Masiakasaurus. Last week, Victoria Arbour's description of the small pterosaur Gwawinopterus was released in the Canadian Journal of Earth Sciences. It's outside of her usual focus on ankylosaurs, but a significant find in that it's the only Late Cretaceous pterosaur with teeth found thus far. More: Arbour's guest spot at Archosaur Musings, Arbour's blog Pseudoplocephalus, and my look at the unique restoration accompanying the press release. The "Dinosaur Wars" episode of The American Experience, which aired on Monday (my review here) is now available to watch in its entirety at PBS. If you're not familiar with the Bone Wars era of paleontology, it's a fine place to get started. Jeff Martz, who writes the always-entertaing Paleo Errata, has made the leap to the science blog network Lab Spaces. The new blog is called House of Bones. Stop by and wish him well! We need more paleontology writers in the blog networks. At Pterosauria, Taylor muses over whether Spinosaurus bore a sail or a bison-like hump. Carl Zimmer's feather evolution article in the February issue of National Geographic is available at the NatGeo website, accompanied by breathtaking photographs by Robert Clark. As noted by Matt Martyniuk, the Anchiornis fossil featured is absolutely stunning. Along these same lines, PBS's Nature is airing an episode about the birds of paradise this Sunday. Though his favored fossil hunting site Quarry 4 has been shut down, Saurian continues to chronicle the ups and downs of his time there. Ichnotaxonomy? Get the scoop on how researchers classify trace fossils in another insightful piece by Tony Martin at the Great Cretaceous Walk. Stuff I've linked to from Twitter recently. 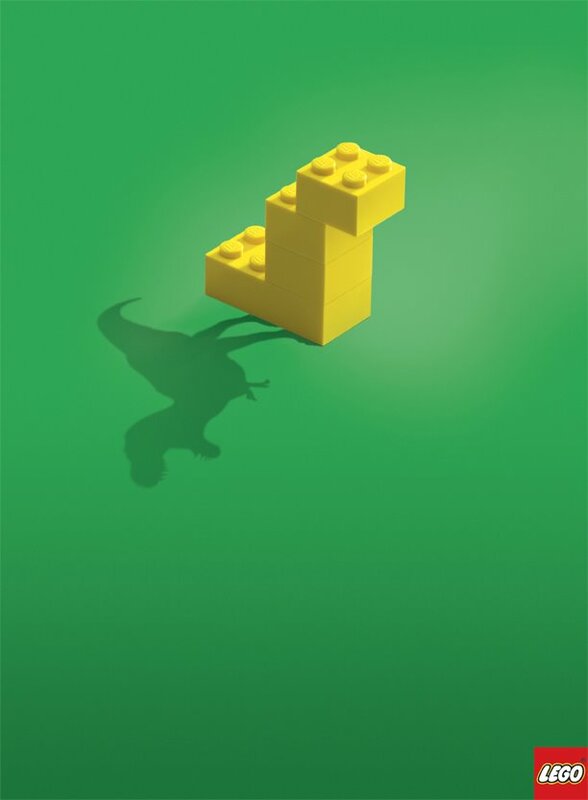 Original Godzilla movie poster. Splendid. WitmerLab hits the small screen, with a cameo on CSI. There's a melancholy quality to the postmortem contortions of this Gorgosaurus. Darren Tanke's series continued. 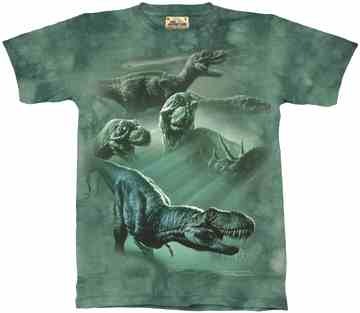 I Effing Love Dinosaurs featured this incredibly cool t-shirt this week. 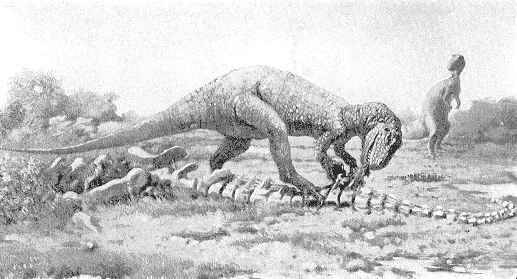 With the new Masiakasaurus monograph coming out, I thought it would be cool to look at an older image from around the time it was first described by Scott Sampson. This, shared by the Madagascar Ankizy Fund at Flickr, was done by Bill Parsons. Check out the skeletal and you'll see just what I meant by the word "fragmentary" above. I'm thrilled to little tiny pieces that Parks and Recreation has returned, after an absence of several months. This is easily the funniest show on TV right now, by my estimation. Ron Swanson is an all-time great sitcom character. While doing a bit of research, I ran across this delightful nameplate* in a volume of The Collected Papers of Henry Fairfield Osborn archived at Google Books. It had been part of the library of paleontologist William Diller Matthew, who donated it to the University of California. *If I got that wrong, any book nerds are welcome to correct me. UPDATE: These are called bookplates, or ex libris. I'm collecting them in a set at Flickr now, whenever I find them. I'm taking submissions, too! Just email them to the address in the sidebar. When looking at the fantastic gallery of Robert Clark's photographs of feathers and their fossils at National Geographic, I was reminded of the most captivating plumage I've seen up close: that of the male Mandarin duck, Aix galericulata. Carl Zimmer's article on feather evolution, which Clark's photos accompany, understandably focuses on flight feathers, those exemplars of natural engineering. Last weekend, while pausing to enjoy the raucous waterfowl of Sarah P. Duke Gardens on the campus of Duke University, I watched a group of Mallards speeding through the air above the small lake they call home and marveled that birds so perfectly adapted for life in the water were also so swift and graceful in flight. Zimmer also discusses the idea that feathers may have first evolved for their peerless display abilities. In the Mandarin, we also see beautiful feathers evolved for display. particularly in that rich reddish mane and stark white mask. But as a duck, the Mandarin also sports plumage evolved for the needs of an animal who spends a lot of time in the water. While in England visiting our friends Marci and Alasdair in 2008, we visited St. James's Park in London, populated by an array of birds including mute swans, coots, and moorhens. At the very east end of the park, just as we were about to cross to Horse Guards Parade, I saw the finest of them all. The Mandarin. I don't think I've ever been so thrilled by a bird, and I'm sure that Jennie and Marci would attest to the glee with which I set about photographing it (Jennie in particular would probably provide an unflattering impersonation, which is one of her more wonderful habits). They're not the most accomplished photos in the world, but they're among my favorites that I've taken. Confession time: At the time, I mistook the Mandarin for a Wood Duck, a species I'd been hoping to see ever since first gazing on its illustrated form in a bird guide when I was a child. They look nothing alike! I saw the Mandarin's elaborate coloration and assumed it was a Wood Duck. What folly! I'm still a little wiped out from ScienceOnline 2011. It was the first professional conference I've ever attended, and the constant stimulation and surprise stood in such stark contrast to my daily life that it's taken some time to process. The ideas that struck me, the connections I made, and the insights others offered have been bouncing around in my mind. It's focused my attention on where it needs to be. To list the people who touched me with their kindness and intelligence would surely only result in me leaving someone out, so let me instead thank everyone involved for making it happen. Please, if you care about science, check out ScienceBlogging.org, ScienceOnline2011.com, ScienceSeeker.org. They'll lead you down tremendously satisfying paths. The most significant part of the experience was my stint co-moderating the Science-Art panel with Glendon Mellow and John Hawks, and I feel that's where I should spend the rest of this post. I had a few ideas in mind, starting points for conversations or bits to add to sympathetic lines of inquiry brought up by Glendon, John, or the attendees. I've discussed these in my previous ScienceOnline special posts. ScienceOnline is an "unconference," and the audience is expected to pipe up as much as the moderators. This was made a bit more complicated by the fact that the session was livestreamed via the ScienceOnline website, requiring anyone who wanted to be heard to speak into a microphone. This wasn't a huge problem, for us though. People attending the sessions about how science bloggers should hold themselves accountable or how to best communicate difficult concepts generally had strong opinions of their own, potent experiences they wanted to share. I think it's different for the Science-Art panel, and not to the disparagement of the attendees. It's simply a more foreign concept, and I had the feeling that the audience was more interested in its moderators' feelings. Glendon is a fine artist as accomplished in his practice as he is enthusiastic about science. John is an anthropologist and illustrator who has an obvious empathy for his subjects and a desire to share the imperfect truth of the fossils he works with. I'm a graphic designer who finds it a little disconcerting to characterize whathe does the way I've done with those two gentlemen. It seemed that one major theme was that accuracy is a false god. Glendon freely revels in the license to depart from reality to explore ideas. John discussed his desire to see our extinct Homo cousins depicted as more than grim-faced brutes, a convention that persists to today. He shared examples that delighted the audience, just as the keenest photographer might by capturing a candid moment of joy. Was there evidence that Neandertals smiled and laughed? Well, not quite. Did these depictions engage the audience and stoke their imaginations? Definitely. I used this as a chance to bring up a recent piece of dinosaur art that speaks strongly to the need to step beyond accuracy. I wrote about it a little over a month ago. It's Brian Engh's Sauroposeidon couple, in full mating display mode. When Matt Wedel encouraged him to think boldly, to look at the outlandish inventions of extant animals and not be afraid to make wild leaps, Brian rose to the occasion and produced one of my favorite pieces of paleoart in recent memory. Illustration by Brian Engh. Used with his permission. What I love about this is that it's so much more than a story about these two dinosaurs. It's the story of Brian's love of dinosaurs: the viewer, who is probably unaccustomed to seeing such wild choices (though not implausible ones, it must be said), is forced to consider why Brian made them. It's a line of thought that necessarily leads to the communication methods of living animals. It's also the story of how we connect to extinct creatures. I think that our willingness to reconstruct lost worlds, to read the clues left by bones and rocks to discover the history of the planet on which we live is one of the most admirable pursuits we engage in. It's poignant, really. It's not science. And that's okay. So many of us are infatuated with the natural world. There are the legions of backyard birders. The customer base for airbrushed wolf t-shirts. Heck, even pet owners, who may marvel at the way their cat's body is built for such wondrous gymnastics. I'd include dinosaur lovers with those people. Or protist lovers. The difference in those last examples is that it takes technology and/or logical inference to observe them, which necessarily casts scientists in the role of interpreters: the prophets who reveal these worlds hidden by scale or time's passage. So to like these things is to "like science." By that analogy, to like wolves may as well be to "like documentary filmmaking," since that's the only contact many of us, including many wolf t-shirt wearers I'd imagine, have with the iconic canids. When I see a well-drawn theropod, I'm entranced by the shapes, the curve of the neck, the excuisite sense of balance, the life in its eyes. The prospect of it as a living creature once again feels more likely. So much of the urge to embark on the journey of science is rooted in that gut-level feeling of wonder, and when done skillfully, the many forms of science-art evoke just that, and the journey begins again. The American Experience presents "The Dinosaur Wars"
Part of the appeal of writing about dinosaurs is the fact that they are so intertwined with my native culture. The study of dinosaurs belongs to everyone, of course, but they are a quintessential part of American culture. As time has gone on, how dinosaurs are presented in the media has complimented American cultural trends. One significant chapter in dinosaur paleontology, the Bone Wars of the late 19th Century, illustrates how the robber baron mentality of the era's industrial magnates played out in the badlands of the west. The PBS series The American Experience visits this drama tonight, in an episode called "The Dinosaur Wars." I've written about the Bone Wars a few times here, and it's well-trodden ground among dinosaur enthusiasts. But it's one of those compelling stories that isn't particularly famous among the general public, and it's certainly due for coverage in this kind of venue. The film's producers, MDTV Productions, know this territory well, having produced a number of dinosaur films in the past. "The Dinosaur Hunters," plays as a tragedy, really. The audience meets Othniel Charles Marsh, Yale's imposing master paleontologist, and the broad-minded if not as well-heeled Edward Drinker Cope. There's the hint that they could be comrades in arms. That hint burns away in a flash as petty jealousies swell into a monstrous rivalry over the western bone fields that alienated colleagues and titillated hype-mongering newspaper publishers. It also resulted in tons upon tons of fossil bones making their way back east, and the discovery of superstar dinosaurs like Stegosaurus, Triceratops, Diplodocus, and Allosaurus. Still, Cope dies bitter and destitute. Marsh, alone for most of his life, dies that way, leaving a band of frustrated lab workers in his wake. My favorite movie is There Will Be Blood, and to different extents, there's a bit of Daniel Plainview's blind, destructive ambition in the hearts of Cope and Marsh. What's scary here is that the virtues of curiosity and reason they possessed as scientists were not enough to keep the darkness in check. Had they gone about their careers in isolation, they probably still would have done good work and left respectable legacies. The obsession that bound them together and set them against each other elevated each man's stature and left behind a towering pile of fossil treasures that is literally still being worked through today. "The Dinosaur Hunters" gives a nice primer on this story, sharing the inspiring vistas of the west, the seductions of discovery, and showing how scientific ambitions can be turned inside out. Like all human history, the history of how we've come to know the dinosaurs has its own incidents of confounding actions and their knotted consequences, and I'm happy to see The American Experience bringing one of these stories to its audience. As spectacles like Reign of the Dinosaurs and Walking with Dinosaurs 3D loom, it's important that those of us who take pleasure in history have their own piece of the dinosaurs' story. American viewers can tune into their local PBS affiliate at 9PM ET/PT. PBS is usually pretty good about having these shows available online, so international viewers can keep an eye on the website, which also features a wealth of supplementary material. At 3:15 today, ScienceOnline will be livestreaming the Science-Art panel I'll be moderating along with John Hawks and Glendon Mellow. Of course, they'll be doing all the other incredibly interesting panels, too. To see any of them, head here. I recently wrote a piece for the SciAm Guest Blog. It was called "How To Name a Dinosaur," and it was a joy to be invited, a joy to write, and a joy to have some nice words said about it. It was also a joy to be able to include the work of one of my favorite up-and-comers in the paleoart world, Matt Van Rooijen. See, my favorite recent dinosaur name is Diabloceratops. Matt's drawn Diabloceratops. I remembered that, wanted to put his name out there, and as we have a relationship already, asking permission to use it was a formality. Hear this, bloggers: it's good to have friendly relationships with artists. Credit them, link to them, purchase them tasty beverages and cozy knitted outerware. They are your collaborators. Diabloceratops, illustrated by Matt Van Rooijen. Used with his permission. Then, a funny thing happened. One of the commenters was Jim Kirkland, who happened to have been an author on Diablo's description. It was really cool to see - any time a real, honest-to-gosh scientist looks my way, I feel real nifty. But I was a bit dismayed when he wrote that Matt's art was "...nearly identical to Brad Wolverton's original art for our press release on Diabloceratops." I don't agree. I don't think that Matt's illustration looks anything like Brad's - which, it must be said, is fantastic - save for the fact that A) It's the same animal, and B) it's viewed from a similar angle. "Nearly identical?" I don't see it. Compare Matt's, featured above, with Brad's for yourself. My point here is most emphatically not to disparage Kirkland. I have a lot of respect for him, and hugely appreciate his ability to do public outreach. It's heartening that he's so willing to stick up for the artist who helped him publicize such a cool dinosaur. I also felt the need to stand up for Matt and left a comment of my own to that effect. I also notified Matt to let him address it, which he did, quite graciously, in the comments. It's a non-controversy, really. A nontroversy, if you will. A nontro, for the brevity-inclined. Still, that gulf between Kirkland's perception and mine is fascinating to me. What do you think? Are they really that similar? Does the fact that Kirkland is a scientist have anything to do with how he saw the two? As moderating a panel at ScienceOnline is more about listening than talking, I'd like to hear the perspective of scientists on this - how do they view the relationship between themselves and the artists and designers that help communicate their research? Does this apparent Mama Grizzly urge to defend her cub seem familiar? If I get to touch on this during the discussion, and anything fruitful comes of it, I'll be sure to expand on this in the near future. Can't wait for this to come to the US. I hope at the end Attenborough flies into the sunset on the back of an azhdarchid. In Flying Monsters 3D, Sir David Attenborough the world’s leading naturalist, sets out to uncover the truth about the enigmatic pterosaurs, whose wingspans of up to 40 feet were equal to that of a modern day jet plane. Driven by the information he finds as he attempts to answer these questions, Attenborough starts to unravel one of science’s more enduring mysteries, discovering that the marvel of pterosaur flight has evolutionary echoes that resonate even today. Did any of my UK readers happen to catch the special television version on Christmas or New Year's Day? So cool! Welcome to 2011, folks! Here's a quick video on Eodromaeus, the new Triassic dinosaur purported to be a basal theropod, from Discovery's Jorge Ribas. Hope to get some time to read the paper soon. In addition to the usual pop-sci sources, I recommend reading more at Chinleana, where Bill Parker offers context for the research. Gwawinapterus by Victoria Arbour, used with her permission. When I checked in with Dave Hone's Archosaur Musings yesterday morning - a daily occurence for me as it is for many other paleo folks - I felt like a gift had been dropped square in my lap from the Olympian heights. Here I was, organizing my thoughts for ScienceOnline, and staring back at me from Google Reader was the fellow above: Gwawinapterus, a new istiodactylid pterosaur from British Columbia. 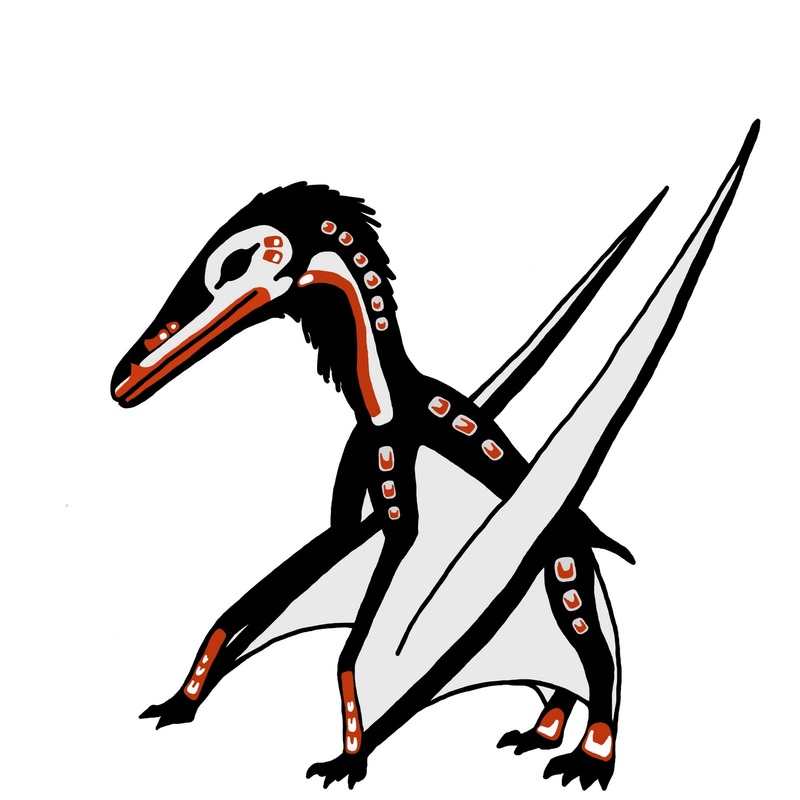 The pterosur's describer, Victoria Barbour of the University of Alberta, wrote a guest post at Archosaur Musings which discusses the critter itself and the scrappy fossils (are there any other kind) she had to work with. But I was entranced by the drawing. I emailed Victoria straight away, asking her who drew it and telling her how much I loved the native art influence. I took a stab and guessed at a Tlingit influence. Why Tlingit? Because that's the Pacific native culture that I'm most familiar with. I readily admit that it would be like someone hearing "Whip It" and remarking, "that's a rather nice Beatles song." I'm basically that dope. Based on comments on some of the news articles that came out yesterday, people seem to either love or hate the colour pattern I chose. That’s ok. The pattern I chose was inspired by the art of the Kwakwaka’wakw, who live on the northern end of Vancouver Island. The name Gwawinapterus is partly derived from the Kwakwala word for Raven, Gwa’wina, because the skull of many istiodactylids remind me of Raven masks. If you read my recent SciAm Guest Blog post, you might guess that I dig what she's done with this pterosaur's name. I love it when paleontologists draw their nomenclatural inspiration from local history and culture. This doesn't just stem from some progressive desire to see science reach underrepresented people. It's also that inluding a cultural reference in a description of a fossilized animal's bones is a tacit acknowledgement that the cultures we create are part of the environment around us and the Earth under us. Pretending that they're separate is foolish. I find Arbour's choice refreshing. An illustration of a prehistoric creature is a hypothesis. Given the power our visual sense holds over us, it's all too easy for the viewer to come away with the impression that it's based on more than it is. When people think "sauropod" they envision the Brachiosaurus of Jurassic Park or the Diplodocus herd of Walking with Dinosaurs. They don't think of the sparse collection of bones from which those visuals are built. The truth is, the brachiosaur Alan Grant gawks at on Isla Nublar is about as close to the real thing as the most whimsical children's book illustration. Working with what little she had, Arbour made some conservative morphological guesses based on the relatives of Gwawinapterus. The choice of such a culturally resonant pattern of color, while not entirely implausible, steps boldly away from the notion of accuracy. It grabs the viewer's attention, makes an emotional impact, and draws them into the story of the animal that inspired it, the far-flung member of a small tribe of pterosaurs. The only pterosaur with teeth known from the late Cretaceous. The speculation this inspires is an important aspect of science, and I imagine that Arbour's fanciful representation of her raven-winged pterosaur will invite many readers to do just that. Special thanks to Victoria Arbour for allowing me to use her artwork here. As I get set for ScienceOnline 2011, I thought that it would be appropriate to share a bit of my own work. Though I intend to do a lot of design work dedicated to science in the future, I've had rare opportunities to do it so far. Of the hundreds of book covers I've designed for my employer, I'd guess that only a handful have been dedicated to science. A much larger percentage are dedicated to the opposite. It only occasionally bothers me; the skills I've honed will be used for science and reason when I move on. I recently did some work at home that fits within the genre of nature illustration, and I'd like to discuss this as it fits in with my goals as a designer. Since they're birds, and therefore dinosaurs, I hope you can forgive this indulgence. I do have a few straight-up dinosaur projects planned and will share those, as well, when the time is right. Almost every year for the last six years, Jennie and I have given calendars to our families, which include birthdays and anniversaries and the like. Though I did a "Birds of Indiana" theme a few years ago, I decided to take another crack at it, using some of my newly developed skills with vector art. I have posted a few of the birds to my Flickr account. I consider them works-in-progress on route to setting up an Etsy shop with Jennie. I plan on picking my favorites and refining them a bit more. Though I have a lot of room to grow, I think that they get across the way I've been working recently. Enjoy, and as always share comments and criticisms freely in the comments. To indulge in a bit of cliche, it seems like yesterday that I was eagerly waiting for registration to open for ScienceOnline 2011. Then, before I knew what had happened, Glendon Mellow tweeted at me and I found myself a member of the Art and Science panel. Me! A panelist! At a conference! And, as it tends to do on the back end of the calendar, time slipped by quicker than I imagined it would. Between the holidays, putting together applications for grad school, keeping up with this blog, and work, ScienceOnline was able to sneak up on me. I'll be leaving for Raleigh-Durham, NC, on Thursday morning, and the next four days will be chock full of science communication talk. I'm really excited, and will not allow my newb status to be a mark of shame. The reason I'm attending this conference, the first I'll have been to, is that I'm pretty comfortable in the belief that I've found the thing I'd like to do forever. How will I weasel my way into the professional science communication community? I'm not totally sure. I know that I want to continue writing and doing graphic design. I'm just not sure what percentage of my time they will each take up, and this conference is going to be a way to help me figure that out. My main point with this post is to discuss the Art and Science discussion. Glendon has been a leading voice in the conversation over how the two pursuits influence and comment on each other, and until he invited me to join in, I didn't realize that I had been taking part in that converstaion in my own way. But looking back at LITC as it has evolved, I realize that much of what I write about has to do with the line between the two. Glendon approaches it from a fine art background. I approach it from a design background and lifelong love of illustration. My own ability as a draftsman is, to put it punningly, sketchy. But I've always been a visual thinker, and in the last three years I've brought my design skills up to a respectable level, and am committed to improving them further in school. To be honest, I feel that I have poor reading comprehension. I won't go into that in too much detail, but when I think about those things I've read, bemoaning the way much of the content seems to have slipped through my memory like sand through a sieve, I find that I still retain striking visual impressions of what I read. Taking Richard Fortey's Trilobite for an example, I can virtually see the author in the unforgiving cold of Spitsbergen, the titular creatures buzzing through Ordovician seas in multitudes, and treacherous Beeny Cliff in Cornwall. I don't think I'm alone in this, though I hope I'm in the minority when it comes to retaining so little of what I read, and I think it's because we cannot help but take the abstractions of written language and translate them into something that might live in the sensual world we inhabit. This is fascinating to me. I'm thinking about this a lot, and I hope I that I can articulate it in a meaningful way at the conference. Hell, if I can articulate a single worthwhile idea at the conference, I'll consider it a victory! I'm also thinking about the difference between art and design. Certainly, both are methods of communicating. And though I don't consider myself an artist, I know that there is something artistic in the choices I make as a designer. There is some expression involved. But it's not as free as true artistic expression. It lives within smaller boundaries and depends on the mercy of multiple masters. Design infuses science communication at all levels, and having spent the last year and a half writing this blog and learning about how science is done, I believe I can make a contribution. Feel free to share your thoughts on science, design, and art below. Sorry for the lack of dinosaurian content here, but the blog will probably be a little quiet for the next week. I'll post what I can while I'm at the conference (follow me @anatotitan on Twitter, as well as the hashtag #scio11), and I'll share my experiences next week. Image from Norman Felchle, via flickr. This week, I'm feeling a little bit crazy. I've got one of them so-called wild hairs up my tuchus. Or is it "wild hare?" Neither sounds good, but that sounds a lot more terrible. So, I'm doing something a bit different by sharing links to other blogs and websites that offer insight into the proud and sometimes wonderfully absurd history of dinosaur illustrations. Mark Crowell has a super-thorough page dedicated to vintage dinosaur books. It includes plenty of representative scans of the illustrations inside and the cover images. Mark also notes where artists stole from, where necessary, which is handy, and provides a nice bibliography of books on dinosaur art. Not as extensive as Crowell's site but worth a look is this one by a fellow who goes by the handle Doubt Boy. The blog Bibliodyssey has featured pieces on old scientific texts featuring dinosaur illustrations a few times: Extinct Monsters, Before the Deluge, & Sketchbook of a Dinosaur Builder. Trish Arnold's blog also features posts on old dinosaur books, with pretty entertaining commentary, to boot. Her posts on John C. McLoughlin's books have been particularly fun to read. One of my favorite sites is the Linda Hall Library Paper Dinosaurs on-line exhibit. Taking you chronologically from the beginnings of paleontology, it provides historical context for some of the iconic images of the science as well as important work that isn't as famous. Charley Parker's always-enlightening art blog Lines & Colors deals with dinosaurs pretty regularly. Perusing Parker's Paleo Art posts, you'll appreciate the critical eye he brings to his writing about the reconstruction of lost worlds. He also has worked closely with Walters & Kissinger, and created the DinoMixer app with two of his friends. 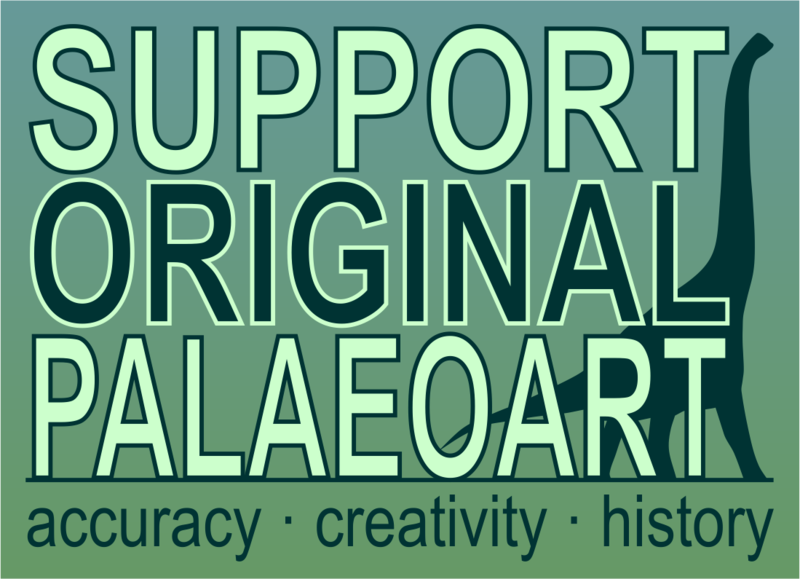 One of the most comprehensive sites dedicated to the evolution of dinosaur art over the years is Paleoartistry: A 180 Year Retrospective, providing loads of insight into the artists and trends of different eras, from the very beginning of what we now know as paleoart. If you're up for doing a bit of digging yourself, and I don't blame you if you do, there are some other good places to poke around for cool old illustrations. You can take a look on Copyright Expired for public domain images. You can root around in the science section of Wikimedia Commons. Flickr has many groups devoted to dinosaurs and paleontology, but none were dedicated to old illustrations exclusively. So I started the Vintage Dinosaur Art group, and it has thrived thanks to the contributions of the two dozen or so members who have joined in. This is a pretty good compilation, but I know there are probably more sites out there that I haven't come across or have grievously forgotten to include. If you know of a site that should be included here, please comment below and I'll continually add to this post. The big deal this week is the fifth installment of the revivified Boneyard Blog Carnival. It's hosted by Zach at When Pigs Fly Returns. Thanks for being a terrific host, Zach! At Dinosaur Tracking, Brian Switek asked "Where Have All the Sauropods Gone?" The nation immediately got that Paula Cole song stuck in their head. Head over the The Great Cretaceous Walk, where Tony Martin continues the thrilling saga of the Lark Quarry "dinosaur stampede." Darren Naish's Stegosaur Wars posts at Tet Zoo have been fantastic. Start here and move on to part two. In the newest post of his guest series at Archosaur Musings about preparing a Gorgosaurus specimen, Darren Tanke touches on latex molding, part of the process that doesn't get much notice. Crurotarsi raved about the Safari Ltd. Postosuchus figure. At Chinleana, Bill Parker provides the definitive guide to Triassic research in 2010. 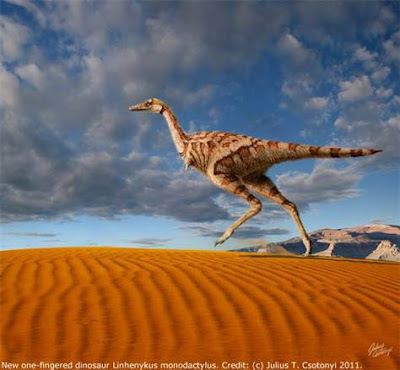 In the beginning of a series, Mickey Mortimer analyzes the little-known taxa named by Chinese paleontologist Zhao Xijin in a pair of posts at the Theropod Database Blog. Have an embarrassing story from the early days of your life in the labor force? Jeff Martz will top it. Humans do some amazing stuff. Injured turtle gets a pair of wheels. The Carnival of Evolution is back at The Dispersal of Darwin! As he writes a UK grant application, Dave Hone asks: How much science communication should / do people do? This week on the Dinosaur Mailing list, Jerry Harris was looking for Victorian-era restorations of Scelidosaurus, a stegosaur. since rooting around for cool old dinosaur illustrations is one of my favorite pastimes, I relished the chance to pitch in. One of the images he already had was this Joseph Smit restoration, from Extinct Monsters and Creatures of Other Days: A Popular Account of Some of the Larger Forms of Ancient Animal Life. I absolutely love a well-executed nature documentary. The finest one I've seen lately is the BBC Yellowstone three-part series from a few years ago. I'm normally not terribly excited by National Park docs, because I've seen one two many that seem to be little more than tourism promotions. But Jennie watched this on one of her recent days off, and knew I'd be super-excited about it. She was right. Each episode covers a season in the park (spring is split between winter and summer), weaving the story of an ecosystem from the deepest geology to the habits of pikas and hummingbirds. It's available on Netflix Instant if you subscribe. I hope more BBC docs are added soon - they're a much higher quality than the overheated NatGeo specials that populate the instant selection. Here's a typically breathtaking clip. A bit delayed, but the sweeter for it, the newest edition of the Boneyard has arrived at When Pigs Fly Returns. Zach did a superb job putting it together, so be sure to send him much digitally conveyed love. Thanks to his efforts it will be plainly apparent to all that the Boneyard is and forever shall be the world's most delightful paleontology blog carnival. I mean that. Your enjoyment will equal or surpass that of this jolly sauropod. A denizen of Disney's Dino Wand USA, snapped by Andy Herbon, via flickr. If you've got a bit of spare time, the library of the Field Museum's flickr photostream is well worth a look. It features a nifty set of photos from the days before the institution moved to its current home on the Lake Michigan Waterfront. During its first couple decades, it was located on the spot where the Museum of Science Industry stands presently. Those were the days before the well-populated dinosaur halls we're lucky enough to wander through today. One Mesozoic denizen of the Field was a reproduction of America's first complete and mounted dinosaur, Joseph Leidy's Hadrosaurus foulkii, towering over a pair of Cenozoic mammals, as if to boast, "I'm basically a Mesozoic cow, y'all!" Besides the simple enjoyment of old photos, online galleries like this one sometimes contain unexpected glimpses into paleontology as it happened. One of the photos shared by the Field library is this sauropod leg found in 1899, identified as Morosaurus impar. Morosaurus is probably one of the most hilariously awful names ever imposed on a dinosaur, meaning "stupid lizard." This was a flash of genius from the Great Dismal Swamp himself, O.C. Marsh. "In his original description Cope predicted the unusually long humerus which the Museum specimen has so well demonstrated. The three specimens may thus be regarded as representatives of a single genus, which, in view of its priority, should retain the generic name Camarosaurus [sic]. The description of the type specimen promised by Dr. Osborn will doubtless throw further light upon the relationship of this interesting group." Though he produced a few works on sauropod anatomy in the years after Riggs wrote this, it wouldn't be until 1921 that Osborne's great monograph would be published. A mere four years later, it was topped by Charles Gilmore's monograph on Camarasaurus, starring what is still considered the finest sauropod skeleton ever excavated. Gilmore's monograph also spelled curtains for the stupid lizard, synonomizing it with Camarasaurus, which took precedent. Though "chamber lizard" isn't exactly glamorous, it's quite a step up from the demeaning epithet thought up by Marsh. The famous Carnegie Camarasaurus, star of the Gilmore monograph. Photo by Kabacchi, via flickr. For more on the Camarasaurus monographs of the early 20th century, check out these two pages at the wonderful Linda Hall Museum Paper Dinosaurs digital exhibition. New from Threadless, it's Tyrannosaurus RAD by Joao Fonte. Perfect for your scientific outreach efforts into the skating community. Image from laurofonte, via flickr. The American Museum of Natural History has announced a new exhibition coming in April called "The World's Largest Dinosaurs." Sauropod fans (and who isn't one, really) will be able to get their fill of what are arguably the most remarkable land vertebrates of all time. As reported by Broadway World, the exhibit's centerpiece will be "a life-sized, detailed model of a 60-foot Mamenchisaurus-will take visitors inside these giants' bodies, shedding light on how heart rate, respiration, metabolism, and reproduction are linked to size." 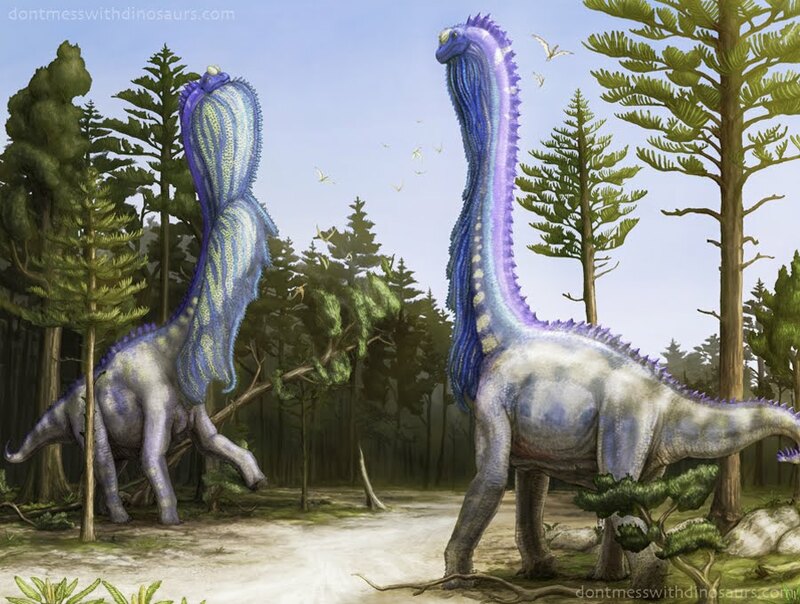 Despite being one of the most iconic dynasties of dinosaur-kind, sauropods are also one of the most misunderstood by the public, who know them as long-necked veggiesauruses but probably haven't had much chance to really explore the fascinating suite of adaptations that allowed them to achieve such great proportions and thrive. Hopefully this will open more eyes to just how outrageously, incredibly cool these animals were. To sign up for email alerts about the exhibition, head here. The AMNH Youtube channel recently featured a look inside the museum's "Big Bone Room" with paleontology collections manager Carl Mehling, included here for your convenience. Also available is a 50 minute talk with Novacek and Norell about their research and adventures from last May, which I somehow missed the first time around, but I'll remedy it just as soon as I can. Pete Postlethwaite, who played the big game hunter Roland Tembo in Jurassic Park: The Lost World, has joined Bob Peck in that great dinosaur hunt in the sky. Condolences to his loved ones and admirers. New year, new day for the Vintage Dinosaur Art posts. Fridays were just too crowded for both Mesozoic Miscellany and Vintage Dinosaur Art, so the higher-ups here decided a schedule change was in order. From here on out, you can expect a pipin' hot batch of dinosaur illustrations from days gone by on Mondays. Mark your calendars accordingly. Tyrannosaurus rex and Triceratops, a brash decision that won't sit well with many. But I respect maverickiness, so you won't hear jeers from these quarters. One of Mort Künstler's website identifies him as "America's Artist," due to the fact that he has focused on American history for much of his career. His current favorite subject matter is the Civil War, and some of this work can be seen currently in an exhibition at the Nassau Museum of Art in Roslyn Harbor, NY. Another site dedicated to him shares much of his print illustration work, and it is well worth a gander. He's a master. It's only fitting that a man so enamored with American history and so adept at illustrating within its pop culture would at some point visit the Mesozoic. Dinosaurs are creatures of the imagination who are interwoven through American history, from the robber baron exploits of O.C. Marsh to their prominence in film to their use by Sinclair to market the very blood on which America runs. This is probably one of the most accomplished artists I've shared in this series, which makes this title all the more baffling. For what I can only assume is a budgetary reason, most of Künstler's drawings have been covered in an ugly smudge of green. I have no idea why this would have been deemed a better option than letting the drawings stand on their own. I've been trying to find out if this is unique to the Scholastic version, but I haven't been able to find any interior images from the 1974 Morrow publication. Künstler's work is pretty good; it isn't often that humble Protoceratops gets treated with such nobility. I can't help but sense he was working with a tight deadline or low pay, though. Or both. I'd love to see him tackle the subject with the time and care he dedicates to his historical work. And it would be nice to see him deal with post-dinosaur renaissance ideas. Man-in-suit tyrannosaurs, anyone? Yeah, me neither. Ornitholestes gets some time, too. First, as a dastardly egg thief. And then, yet another knockoff of the Charles R. Knight illustration of the small theropod. 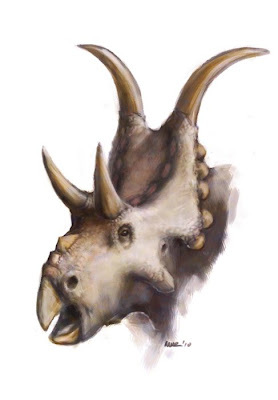 Though Künstler is, as I said above, a master, I can't let this end without sharing this, which might be the single ugliest Triceratops illustration I've ever seen. If Sloth from The Goonies and a Triceratops had a love child, this would be it. In this case, the green smudge sort of helps. Boneyard 2.5: Time to Submit!